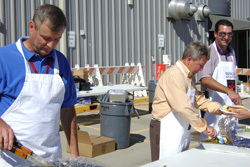 Left to right: Goverment & Special Programs Manager Rich Baeder, Vice President of Sales John Slieter and Manager of Engineering Services Ryan Oestmann serve lunch at a United Way fundraiser in Lincoln, Neb. this afternoon. One of Duncan Aviation’s "Core Values" reads "Support our communities and encourage volunteerism." This isn’t just a passive statement; it is lived out loud daily among many Duncan Aviation team members with the full support of members of the Senior Management Team. For more than 20 years, Duncan Aviation has held annual fundraisers to support United Way. Today, we kick off the beginning of this year's United Way campaign with a free-will appreciation lunch at our Lincoln, NE, and Battle Creek, MI, locations. While we enjoy all the planned activities, we keep in mind the ultimate purpose: that the residents of our communities have hope for a better life tomorrow because we choose to participate to make a difference today. When members of our community face hardships, we are all affected. The good news is that we can join together, neighbor helping neighbor, to make a difference. It all starts with us, because we We Live United!